Read Monsoon Shootout movie review on BollywoodMDB before booking your tickets for the Nawazuddin Siddiqui starrer. Based in Mumbai, the story of Monsoon Shootout revolves around Shiva (Nawazuddin Siddiqui), who works for a local boss called the Slum Lord. Crime Branch is looking for him for threatening a high-profile builder for extortion. Rookie Adi (Vijay Varma) joins the team in their mission of bringing Shiva to book. In a rainy, monsoon night, he even gets his hands on Shiva, but as soon as he aims his gun to shoot him, his mind is bombarded with an avalanche of thoughts. He is unable to decide which path is right. The path of right? The path of wrong or the middle path? He is confused whether he should shoot Shiva, catch him alive or simply let him go as he might be an innocent man. Who knows? Will Adi be able to choose any path before its too late? To know watch the film. We all know Nawazuddin Siddiqui as an actor who hardly disappoints his audience. No matter whether he gets to play a small role or the whole film revolves around his character, the actor always succeeds in impressing the audience. In this film, he exceeds all your expectations and delivers more than what you expect from his an an actor. In simple words, Monsoon Shootout is a must watch, where Siddiqui delivers an award-winning performances. His role in the film may remind you of another sinister character the talented actor played in Anurag Kashyap Raman Raghav 2.0, but a few minutes into the film, you will realize that there is no similarity between both the character. Talking about other actors, Vijay Varma in the role of a cop is convincing. He portrays his part with utmost honesty and delivers an applaudable performance. Tannishtha Chatterjee as Nawaz’s wife is amazing. Despite getting limited screen presence, she leaves an indelible impression. The entire supporting cast lends full support to lead actors. Monsoon Shootout is directed by Amit Kumar, who got the idea to make this film after watching Robert Enrico's Oscar-winning short film An Occurrence at Owl Creek Bridge. As a debutant, he has written and directed a film which will not let film enthusiasts forget his name so easily. Along with directing, he has also written the movie. His writing is crisp and direction very focused and sharp. Kumar very deftly takes the narrative of the film to an explosive conclusion with the help of his competent direction, well-toned storytelling and arty style of filmmaking. Amit Kumar makes a very promising debut. We hope his future ventures, too, showcases the same kind of maturity and competence that he has displayed in his first attempt at direction. The film has been shot on real locations of Mumbai which adds rawness to it. It has grade A production value and has been seductively shot. Editing of the film is crisp. Background score of the film is terrific. Music of the film is situational and goes well with the explosive nature of the storyline. There are only two songs in the album - ‘Pal’ and ‘Andheri Raat’. Composed by Rochak Kohli, the first song ‘Pal’ has been magically rendered by Arijit Singh. Lyrics of the songs are also very riveting. The song plays in the background and is amazing. The other song, Andheri Raat’ is also a good song having foot-tapping beats. Watch this explosive crime-thriller for Nawazuddin Siddiqui’s intense and unforgettable act. He pulls off his character really well. 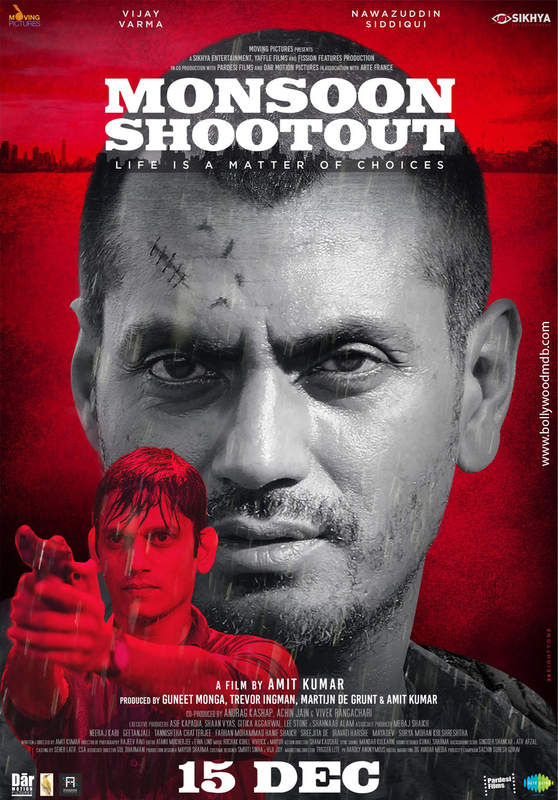 Monsoon Shootout is a well-written, well-directed and well-acted film that leaves a lasting impression on the mind. Abhishek Bachchan and Priyanka Chopra to team up again! Balasaheb Thackeray biopic to go on floors from March 25th! Karan Johar to quit acting and stick only to filmmaking? Salman Khan’s Bajrangi Bhaijaan premieres in China!